That is the message from Enterprise Publisher Vinnie Williams, spelled out in her “Off the Record” column in the Sept. 1 issue of the paper. Williams says the Enterprise’s policy of not running ads “has cost us considerably,” but “the Bloody Mary and her mixed kin are taboo” in the paper. She says the taboo will remain even though “the shopper down the road is publishing large liquor store ads” in its pages. “Mixing liquor ads and kids–you just don’t do that,” Williams scolds. “The shopper down the road,” of course, is The Oconee Leader. Both the Enterprise and the Leader have their offices in the wide “corner” of Barnett Shoals Road and SR 15 in downtown Watkinsville. Williams doesn’t even call her competitor a newspaper, preferring the less flattering term of shopper. In the business, a shopper is a newspaper containing advertisements and some local news. It usually is distributed free. The Leader contains some local copy, and it is distributed free to nearly all of the approximately 9,000 mailboxes in Oconee County, giving it what is called total market penetration. That contrasts with a paid circulation publication such as the Enterprise, which has an unaudited circulation of 4,000. 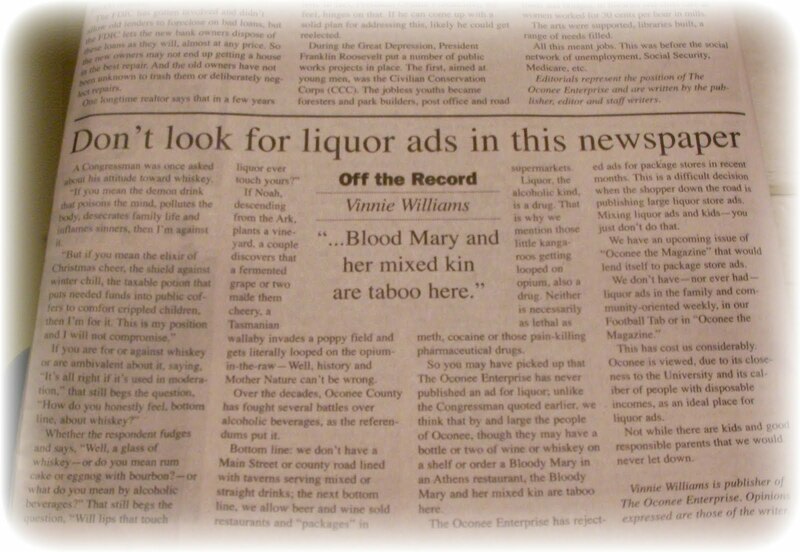 The two papers have been going head-to-head in competition for local advertising since the Leader appeared on the scene in August of 2006, and the opening of the liquor line of attack may be a sign of fights to come in this difficult economy and tight advertising market. In conservative Oconee County, where voters have refused to approve liquor sales and where even the sale of beer and wine in restaurants has been controversial, the liquor attack strategy might have some success. The timing of the Enterprise attack was perfect, either by luck or through inside information. The Sept. 1 issue of the Leader contains, on the back of the paper, a full-page, color advertisement for Five Points Bottle Shop, with Athens locations on Lumpkin Street and on the Atlanta Highway. The back page is one of the most prominent advertising pages of the paper. Center focus of the ad: Jack Daniels HAND-SELECTED Single Barrel whiskey! The Aug. 25 and Aug. 11 editions of the Leader didn’t contain any ads for liquor, beer or wine. But the Aug. 18 and Aug. 4 editions each contained a half-page color ad for ABC Package Liquor Store on West Broad Street in Athens. Above the fold and ad were a picture of a Baptist church outing, a picture of a local women’s group and a wedding photo. Above the fold this time was a picture of a girls’ machine-pitch softball All-Star team. The girls are ages 7 and 8, according to the cutlines beneath the picture. The advertisements were all the more striking because stores such as the Five Points Bottle Shop and ABC Package Liquor are not allowed in Oconee County. The two papers differ in many ways in addition to one’s stated abhorrence of and the other’s obvious enthusiasm for liquor ads. The Leader is tabloid-size, and the Enterprise is a broad sheet. The Leader contains local stories, mostly features, often focused on young people. The stories are usually upbeat. The Enterprise is heavy on hard news about government. Its editor is a regular at Board of Commissioners and other government meetings. The Leader ignores most such material or covers it by getting comments after-the-fact from officials. The two papers also have similarities. Both place a heavy emphasis on local school sports. And both can be shrill, particularly on their editorial pages. The Leader doesn’t comment on local issues, preferring instead to rant about national politics. President Obama is a frequent target. The people the Enterprise doesn’t like are usually local. I have come in for criticism several times, but I’ve never been called either a genius (evil or otherwise) or a moron by the paper, as far as I can recall. Both papers have gotten thinner during the economic downturn. The Aug. 25 issue of the Leader was only 16 pages. The larger-format Enterprise on Aug. 4 edition also was down to 16 pages. The Enterprise gets revenue from paid circulation. A free “shopper” obviously does not. The Enterprise also is the designated legal organ of the county, that is, the place where government places its legal advertisements. To be designated the legal organ, at least 75 percent of the paper’s circulation has to be paid. A free “shopper” doesn’t qualify. While the Leader produces less copy for a smaller paper, it prints many more copies of that paper, usually with extensive and expensive color. Printing costs are a big part of any paper’s budget. An ad representative for the Leader told me this spring the paper was printing 12,500 copies each week. An Enterprise ad rep said the paper printed 4,300. The Sept. 1 issue of the Leader contained 23 stories, some quite short, and two columns. The same edition of the Enterprise contained 36 stories, many quite long, plus 11 columns. The two papers have roughly comparable ad rates on a per column inch basis. A two column by five inch advertisement in the Leader cost $105 this spring, while the same size advertisement in the Enterprise cost $100. Publisher Williams said in her column that she has rejected “ads for package stores in recent months,” and the policy is firm. “We don’t have–nor ever had–liquor ads in the family and community-oriented weekly,” she wrote. Despite that pronouncement, those half-page liquor ads and maybe the full-page ad in “the other paper” had her thinking about that policy enough to write a column about it. According to the paper’s rate card, a single insertion half-page ad in the Enterprise would bring in $628. A full-page ad would fetch twice that amount: $1,257. Plus perhaps a bartender’s tip on how to make a classic margarita or a lemon drop martini.